The Village at Tuscan Lakes located in League City, Texas is a gated 55+ active adult community. This highly desirable destination, located 30 minutes southwest of Houston, offers an ideal blend of culture, recreation, and lifestyle. The Village at Tuscan Lakes features a charming clubhouse, resort-style pool, golf practice facilities, and other remarkable amenities. There is a wide variety of clubs and interest groups that cater to the socially active and fitness-minded residents in the community. This Del Webb community will feature 358 low-maintenance single-family homes. One of the perks of living in The Village at Tuscan Lakes is that you can relax knowing your community will keep looking as gorgeous as the first day you saw it. That’s because the reasonable homeowners' association (HOA) fee helps preserve all of the community’s common areas and amenities. People from other states and around the country have flocked to The Village at Tuscan Lakes. Social activities and events start at The Village at Tuscan Lakes' exquisite 12,000 square-foot clubhouse. Here, residents can work out in the modern fitness center or aerobics studio, gather in the multi-purpose room, or read a book in the library. Homeowners can also pick up a new hobby in the arts and crafts studio, attend an event in the ballroom, or socialize with friends around the billiards table. A catering kitchen is also available for preparing a meal with friends. Outside, residents can take a dip in the crisp pool with beach entry or relax in the shade in the idyllic outdoor patio. Golf enthusiasts can practice their game on the putting green. The horseshoe, bocce ball, and shuffleboard courts provide a great place for friends to enjoy a fun game. On a beautiful afternoon, residents can fish in the stocked pond or go for a jog along the walking and biking trails. In 2007, Centex Homes began building single-family homes within the gates of The Village at Tuscan Lakes. The community was later acquired by Del Webb, a leader in active adult communities. This community has a total of 358 homes offered on a resale-only basis. A variety of housing styles and prices are available that match the preferences and budgets of almost any buyer. There are three series of homes: Gardens, Classics and Estates. The Gardens Series has three different models that range in size from 1,109 to 1,469 square feet. These homes feature two bedrooms, two bathrooms, and a two-car garage. The Classics Series offers five models that range in size from 1,628 to 2,025 square feet and feature two or three bedrooms plus a den, two or two-and-a-half bathrooms, and a two or two-and-a-half-car garage. Lastly, the Estates Series offers three models that range from 2,272 to 2,581 square feet and feature two or three bedrooms plus a den, two-and-a-half bathrooms, and a two or three-car garage. These homes are well-equipped to please today's active adult homebuyers thanks to Del Webb's proven expertise in developing 55+ communities. At The Village at Tuscan Lakes, there is a rich assortment of amenities, activities, and clubs to suit almost any lifestyle. An activities director is continually supplying the residents of the community with an ever-changing lineup of fun activities, events, and classes. Some of these include wine tasting, garden club, bingo, bridge, line dancing, Mah Jongg and much more. Whether your passions include cards, arts and crafts, golf or bible study, there is something for everyone at The Village at Tuscan Lakes. The clubs and activities provide a wonderful opportunity to build new friendships and allow residents to reap extraordinary rewards through social, fitness and educational engagement. Residents also pay an annual HOA fee that covers lawn care, alarm systems, sprinklers, and front yard maintenance. This allows residents to not worry about tedious tasks and live their life to the fullest by pursuing their hobbies and enjoying fruitful relationships with neighbors. 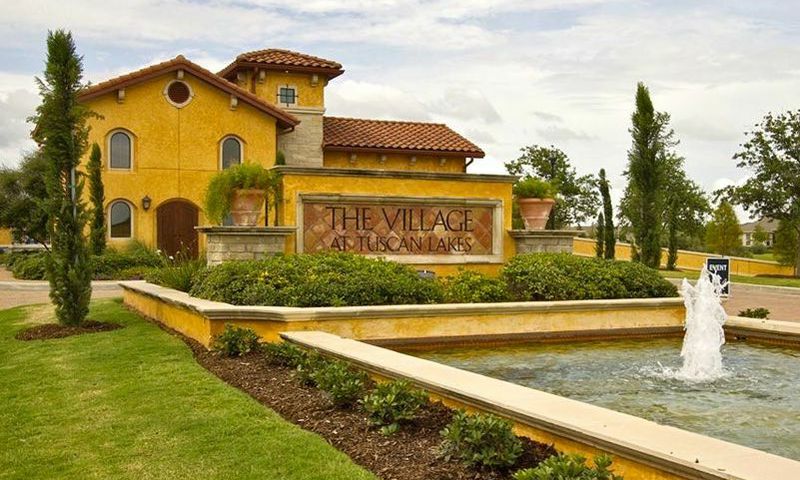 The Village at Tuscan Lakes is located in League City, Texas. It is conveniently located near Highway 96 and I-45. Galveston Island is 30 minutes away and it is only ten minutes away from Kemah boardwalk and waterfront. Just minutes from the community residents can enjoy L.A. Fitness, CVS, and several fast food options. The Historic District, Bay Colony Town Center, League City Towne Center, and Baybrook Mall all offer numerous shops. Medical facilities, shopping, and restaurants are all easy to access from The Village at Tuscan Lakes. The Village at Tuscan Lakes is the perfect 55+ community in League City, Texas for those who want incredible amenities in an unbeatable location. There are plenty of activities available in The Village at Tuscan Lakes. Here is a sample of some of the clubs, activities and classes offered here. The Gardens Series has three different models that range in size from 1,109 to 1,469 square feet. These homes feature at least two bedrooms, two bathrooms, and a two-car garage. These homes are available on a resale-only basis. Additional features include patios, eat-in kitchens, and a walk-in shower. The Classics Series offers five models that range in size from 1,628 to 2,025 square feet. These homes feature two to three bedrooms, plus a den, two or two-and-a-half bathrooms, and a two or two-and-a-half-car garage. Additional features include an ample amount of natural light, covered patios, and granite countertops. The Estates Series offers three models that range from 2,272 to 2,581 square feet and feature two or three bedrooms, plus a den, two-and-a-half bathrooms and a two or three-car garage. Special features include island kitchens, flexible living space and extra garage storage. This is a wonderful community. Great amenities, very good social director. The homes are very well built and yard maintenance is provided. We've been here for a little over a year and have only good things to say about it. Excellent pool, exercise room and clubhouse. Very close to shopping, library and highways 3 and 45. I wish the builder would have designed the homes to look more Tuscan themed like the clubhouse but overall they are nice. The clubhouse is fantastic. We spend a lot of time using the gym, the pool and the library. It's also great having the golf practice right here, we just grab a couple clubs and walk over for a little practice. Home prices here are reasonable considering everything you get n the clubhouse and the team here maintains everything very well. 55places.com is not affiliated with the developer(s) or homeowners association of The Village at Tuscan Lakes. The information you submit is distributed to a 55places.com Partner Agent, who is a licensed real estate agent. The information regarding The Village at Tuscan Lakes has not been verified or approved by the developer or homeowners association. Please verify all information prior to purchasing. 55places.com is not responsible for any errors regarding the information displayed on this website.